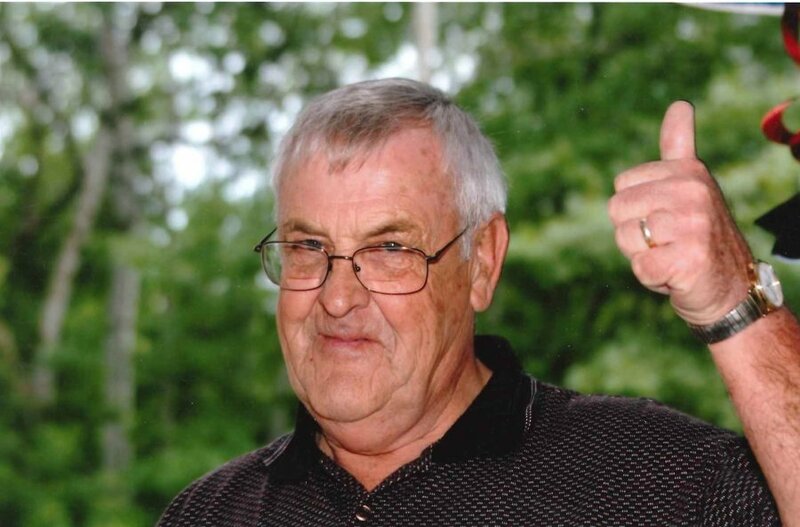 Arlen W. Swenson of Hackensack, Minnesota danced his way to heaven with the angels to be with his Lord & Savior on April 8th, 2019, after a brief battle with cancer. He was the fourth eldest of twelve children born at home on the farm to Willard & Bessie (Nelson) Swenson on April 6th, 1934 in Wolf Creek, Wisconsin. Arlen attended Grantsburg High School and his working career started as a dock worker at Central Warehouse in St. Paul. He attended Dunwoody Institute for training in HVAC and received his boiler license to become a Maintenance Engineer. He met Marcella Sporcic of South St. Paul in 1952 and they married in July of 1954. Their marriage was blessed with six children. In 1973, Arlen & Marcie moved their family to Hackensack, Minnesota where they owned and operated Green Roof Lodge for ten years. Arlen also worked extra jobs as school bus driver, milk delivery and Township Assessor & Zoning Officer. After selling the resort when their “free help” aka children moved away, they retired on Woman Lake. Arlen, not able to sit idle, continued to work. He worked for Tim’s Outboard for many years, then Jerry’s Red Owl in Hackensack. Mark’s Market (formerly Jerry’s Red Owl) was where he continued to work as a meat cutter until he passed away. He loved his co-workers, the customers and the tourists. He frequently said, “I work, so I don’t have to decide do I sit in that chair, that chair or that chair?”. His hobbies were helping his children with an abundance of home projects, detailing numerous cars, many trips with Marcie and driving the countryside looking for the best gas price around (with a coupon)! He and Marcie wintered in Texas for many years. The last ten years they considered their home to be Bentsen Palm RV Park, where they enjoyed good friends, good times and great memories. He was a gentle soul with a smile that would light up a room or a smirk that could push Marcie’s buttons! He taught many of his grandchildren to tie their shoes. He always greeted you with a hug, enjoyed teasing and loved spending time with his family and friends. He will be deeply missed by all who loved him! Those left behind to cherish his memory are his loving wife of sixty-five years, Marcie and their children, Jeff (Casey), Scott, Kerry (Chris), Tim (Lori), Lora Huston (Greg), Christopher (Gina) as well as 12 grandchildren, Christina (Greg), Shaun (Andrea), Suzy (Ben), Dustin (Julie), Daniel, Lisa (Brad), Sarah (Sam), Zak (Brittney), Adam (Leah), Megan, Hayden, Hadley and also 16 great-grandchildren, Adyson, Camdyn, Keegan, Bryson, Avriel, Aunika, Maddie, Katie, Brynn, Liam, Reece, Riley, Holly, Quinn and new babies Brooke and Audrey Jo. Also, brothers Curt, Gene, Richard, Billy and Darrel, along with sisters Betty and Diane, many nieces, nephews, friends and Uncle Steve and Aunt Joanie Sporcic. Arlen was preceded in death by his parents Willard and Bessie Swenson, brother Peter, sisters Marion, Marlys and LuAnn, granddaughter Katherine Huston and great-grandson Jackson. A Mass of Christian Burial for Arlen will begin at 11:00 a.m., Wednesday, April 24, 2019 at Sacred Heart Catholic Church in Hackensack, MN. A one hour visitation will be held prior to mass at 10:00 a.m. at the church. Fathers Anthony Craig and Timothy Lange will officiate. Pallbearers for Arlen will be his grandsons Shaun Swenson, Dustin Swenson, Daniel Swenson, Adam Huston, Zak Swenson and Hayden Swenson. His honorary pallbearers are his great grandsons Camdyn Janacek, Keegan Janacek, Bryson Swenson, Liam Swenson, Reece Swenson and Riley Swenson. Interment will be in the Hillcrest Cemetery at Hackensack, MN following his service. There's still time to send flowers to the Visitation at the Sacred Heart Catholic Church from 10:00 AM to 11:00 AM on April 24, 2019.